1. Let’s just start with the fact that this book made me cry. It’s an utterly heartbreaking book, beautiful in the torment and suffering that is manifested through its words. Though Monelle instructs, “Words are words while they are spoken. / Unspoken words are dead and beget the plague. / Listen to my spoken words, and act not according to the words I write,” these written words are the only spectral trace we have left of her. 2. I first heard about the new translation of this significant work at Harriet. 3. 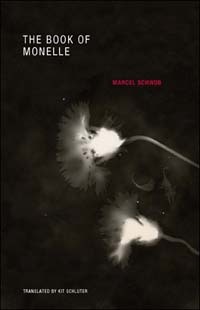 The synopsis of the book reads: When Marcel Schwob published The Book of Monelle in French in 1894, it immediately became the unofficial bible of the French symbolist movement, admired by such contemporaries as Stephane Mallarmé, Alfred Jarry, and André Gide. A carefully woven assemblage of legends, aphorisms, fairy tales, and nihilistic philosophy, it remains a deeply enigmatic and haunting work over a century later, a gathering of literary and personal ruins written in a style that evokes both the Brothers Grimm and Friedrich Nietzsche. The Book of Monelle was the fruit of Schwob’s intense emotional suffering over the loss of his love, a “girl of the streets” named Louise, whom he had befriended in 1891 and who succumbed to tuberculosis two years later. Transforming her into Monelle, the innocent prophet of destruction, Schwob tells the stories of her various sisters: girls succumbing to disillusion, caught between the misleading world of childlike fantasy and the bitter world of reality. This new translation reintroduces a true fin-de-siècle masterpiece into English. 5. If Monelle is a prophet, she is utterly of the present, of the moment, and of silence, because in life and suffering everything becomes a mirror to one’s suffering, and because in death there is only silence, but there is also the hope of forgetting. 7. The translator gives two possible ways to interpret the name Monelle. First, the French translation that roughly translates into “My-her,” which implicates a strange hope for possession. Indeed, the narrator (whom we take to be Marcel’s tortured self) says, “And as I looked over the plain, I saw the sisters of Monelle rising.” Because every “her” is Monelle. And Monelle is every her. And yet, Monelle is of the past and infinitely elusive.